Built in 1849, Abbasi Masjid is situated right at the entrance of the Derawar Fort. It follows the style of the Moti Mosque in Lahore, as well as that of the Jamia Mosque in Delhi. The beautiful building is usually adorned with colorful lights. 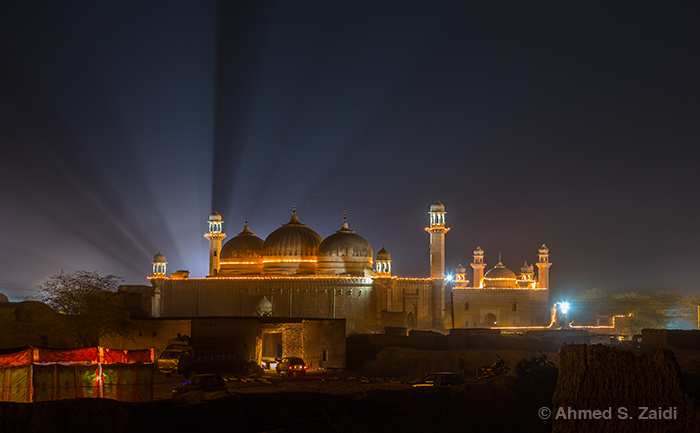 The night before the annual Cholistan Desert Jeep Race, a flood light was placed behind it that caused the dusty sky to light up.